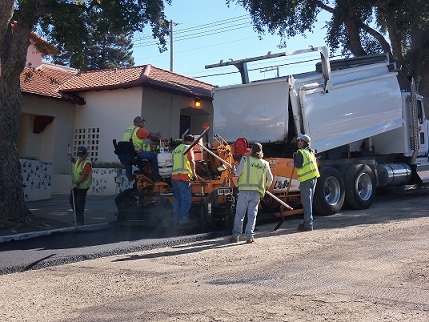 The Streets section is part of a skilled team that is dedicated to the maintenance and repair of City streets, which totals approximately 714 lane miles. A lot of factors come into play when determining which streets can be repaired during each fiscal year. The links below provide more information on how those decisions are made. • Streets & Potholes FAQ page - What is a Pothole? How are Potholes fixed? If you would like to learn more about Traffic Calming measures used by the City and how to request a survey of a specific area, please visit the Traffic Engineering page. Help keep our City and Community clean by removing clutter and debris from the roadway. Street sweeping helps keep contaminants from polluting streams and bay waters through storm drains. Clean streets and neighborhoods –that's our goal. With your cooperation, we can do a better job of keeping our City clean! **Note** The Street Sweeping section works diligently to provide efficient service to Vallejo citizens. As such, we try to sweep all streets at least twice a month. However, due to staffing and equipment limitations, we only guarantee that your street will be swept on the FIRST date listed on your route schedule. Use the "Search" function below to type in your address and see what route your street is on. You can zoom in to get more detailed information such as the day(s) and week(s) your street is cleaned. Hold your mouse pointer of a street sweeping line to see interactive feedback for the schedule details. If your schedule street sweeping date lands on a holiday, that area will not be swept. Those areas affected by a holiday will be swept either 5 working days before or 5 working days after that holiday. To report a non-emergency maintenance issue, please use the form below. Help keep our streets safe! By reporting hazards, we are able to respond to problems more efficiently. You can also report a street maintenance problem by calling (707) 648-5235.